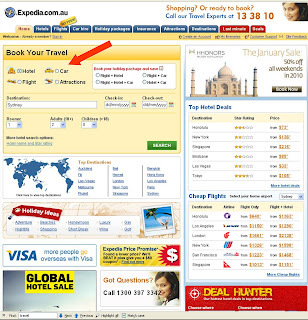 Late last year I shared with you a screenshot showing that Expedia.com.au were trialling a Wotif list like display for hotel results. With the new year I can see that they are trialling a new home page with larger widget and hotels as the default for search. First sale of the year is a 50% off hotels. Is Expedia giving up on Air in Australia? Screenshot below. It would be interesting to see what the distribution of sales were between hotels and air last year for Expedia. From my point of view, Webjet have tried very hard to be the first point of contact for consumers looking to book air product online and it wouldn't seem logical for Expedia to try and tackle them head on. It may be a case of play your strengths and if so, Expedia is definitely strong when it comes to hotels. Interesting find! At the moment it seems like suppliers are happy to get as pig a piece of the pie as possible, but how long can that go on? Just look at what Singapore Airlines did to Flight centre- clearly they don't think they need the business. I wonder if Expedia are looking at the future of their air product sales online and are hoping to minimize the potential impact of a change in business model? - that leaves hotels as the place to make money in the medium term. I think thats probably pretty spot on. If you look purley at site visitation, its working quite well for Expedia. I looked at a graph over the last 12 months and it looks like Expedia are really pulling away! Could have something to do with Expedias sale, but most refers are from from Tripadvisor. It really is a case for "stick to what you do well".